To say I haven't been fishing much lately would be an understatement. First, a stretch of good gigs kept me off the water. Then some guide trips got me back on the water, but not actually fishing myself. That's okay, my clients caught fish and I was happy. Then the flu took me off the water again, which was pretty miserable. I had a pretty good streak going earlier this season. I don't know the exact figure, but I think I landed in the neighborhood of 15 salmon in a row without losing one. There were a couple I definitely should have lost in that stretch, but I got really lucky. The universe and the salmon struck back, however. If I look back at my reports, the last salmon I actually landed was a month ago, on October 21. Yikes! More alarming is that I've only fished three times in the space of a month. Losing that hour in the evening now prevents me from making any more end of the day fishing trips. I guess I'm happy I was able to fish as much as I did early in the season. So today was the day to end the streak and get back in the black. Of course, despite rain, the water is as low as ever. It's way too low. 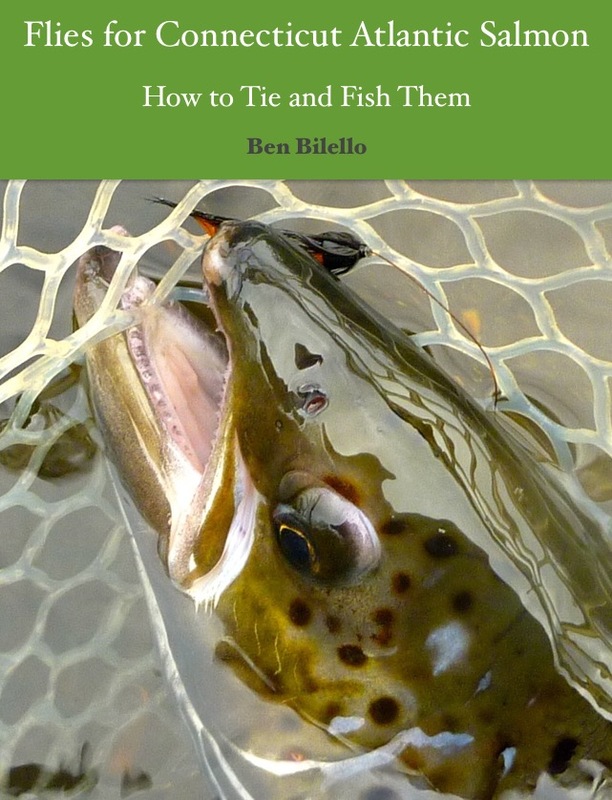 Not only does it prevent the salmon from moving, but it pushes all the anglers together. The water was warmer than I thought, topping out in the mid 40s. It was damp and cloudy, but the air temperature was relatively warm (50s). I thought for sure it was time to start sinking a fly. I thought wrong. They wanted nothing to do with a sunk fly. It amazes me that they're still going after the same stuff I was fishing in mid October. I rolled a few fish on a #6 Same Thing Murray and a #6 Mickey Finn. The only solid grab I had was on the MF, however. The salmon pictured above broke my dry spell, thank goodness. I met up with my friend Roger for couple hours this afternoon. It didn't take long for Roger to roll a salmon with his Matuka. A few minutes later, I saw Roger playing a fish. I went downstream to lend a hand with landing the salmon. I got the fish in the net, took a closer look and did a little double take when I saw the fly in its mouth. Roger caught that sucker on a dry fly! A proper salmon dry fly... a grizzly and white Carter's Bug! And well into November to boot! Roger mentioned that his friend took another on a Bomber a few days prior. So not only are the salmon still interested in wet flies fished high in the water column, but they're even taking flies on top. Despite cold weather and falling temperatures, it seems like the fish are still taking their cues from the water level more than anything else. Check out the fly...a white & grizzly Carter's Bug! Let that be a lesson to me. Just when I thought the salmon had reached the height of their unpredictability, they seemed to go that extra mile. I abandoned dries about a month ago. Sounds like I should have kept fishing them all along! Naugy salmon on a dry...welcome to the club, Roger! I don't have many more fishing days left in me this season. Hopefully this wasn't the last one. Soon it will be time to start tying fancy flies once again.